People born Aquarians amid the Chinese astrological year of the Monkey are destined to be bouncing with energy. This animal�s notorious entertaining nature mixes very well with the Aquarian quick wit and imagination. The resulting Aquarian Monkey personality is a fun-loving individual with a huge amount of curiosity who loves to surprise people. Having an Aquarian Monkey around means you will never be short of someone to keep you cheerful. These characters do not like to be alone, or still, for any length of time - they need to be active. 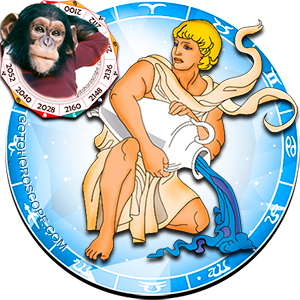 The Aquarius originality trait and the humor of the Monkey furnish these personalities with an endless stream of new ideas. The Aquarian Monkey is energetic from the day he or she is born, so they find sitting still and doing nothing almost impossible. As soon as they can talk, they will usually discover the power of the fun they can have making people laugh. These are one of the bubbliest personalities, with a natural ability to amuse others with their words and antics. With all this character, the Aquarian Monkey attracts and expects lots of attention. He is bright and cheery the majority of the time, making him an excellent choice as a supportive friend. In closer relationships, they tend to crave intellectual stimulation more than physical. A personal commitment, once made, will be taken very seriously by these individuals. Telling jokes and playing little tricks on people is something that the Aquarian Monkey soon gains a reputation for. This can present as the occasional joviality, or it can be too intense. The Aquarian Monkey must learn to judge people�s reactions to his or her mischievous behavior and adjust it accordingly. If they can discover a happy medium with respect to this particular side of their character, then it will serve as an advantage. Friends and partners need to be chosen carefully, and should be those who will prevent these Aquarians from not taking life seriously enough. The lively and alert Aquarian Monkey personality can utilize his mirthful talents in many different ways. Working with others, they help keep spirits up with their happy, fun outlook on life. When they are not joking, around Aquarian Monkeys are highly industrious and can turn their hand to the most complicated tasks. They are devoted to their friends and family, and generally keep them close by. Even though they have a craving for knowledge and adventure, their family-loving temperament stops them from wandering too far for too long. The predominant humorous streak associated with the Aquarian Monkey can be a fantastic asset. It can also be troublesome and a weakness of the character as opposed to a strength. It may become a problem if people on the receiving end of the jesting do not find it funny. Not everyone warms to the comical Aquarian Monkey�s stance. They can also have a tendency to be impatient, and this often does them no good. The best companions of these Aquarians will be able to teach them that sometimes things are worth waiting for. My husband is the above combination, however, this is nothing like him. He is so mellow and quite and is only outspoken when need be. his words ae worth gold cause he is not likely to talk for the sake of hearing himself speak. he is very loving and hardworking. He is a serious man and it takes a lot to make him laugh or be silly. this post is way off. This is the real characteristic for me! This seems pretty accurate to me! I love reading tthings that help me gain an understanding of how the universe made me!